These changes were inevitable, a consequence of the growth and geographic dispersion of the practicing communities. monks expanded and elaborated both doctrine and disciplinary codes, created new textual genres, developed new forms of religious praxis, and eventually divided into numerous sects or schools. Hence, the actual circumstances for the first schism remain obscure and tied to other roughly contemporaneous events that later traditions connect with possibly 3 additional early Councils. The first of these events, recorded in the monastic records of virtually all later schools, is the Council of Vaiśālī, which most sources date to approximately 100 years after the death of the Buddha. Monastic records suggest that this Council was convened in response to a disagreement over certain rules of monastic discipline, but do not state that the Council resulted in a schism. Later Pāli chronicles and the records of Chinese pilgrims and translators explicitly link the first schism with the outcome of either the First Council immediately after the death of the Buddha or this Second Council of Vaiśālī. b) the decisions concerning the rules of monastic discipline rendered at the Second Council. These dissenters, who constituted the adherents of the “great community” (mahāsaṁgha), recited a textual collection of their own and formed a separate Mahāsaṁghika school. These 5 points suggest that Arhats are subject to retrogression from their level of religious attainment or to limitations such as Doubt, ignorance, various forms of assistance from or stimulation by others, or the employment of artificial devices such as vocal utterances in the practice of the Path. Although these points have been interpreted in traditional and many modern sources as an attempt to downgrade the status of the Arhat in general, it is possible that they reflect an attempt primarily to distinguish and to clarify specific stages in religious praxis. The later textual sources of the northern early Buddhist schools relate that the supporters of the 5 points were more numerous and hence were referred to as the Mahāsaṁghikas, “those of the great community”; the minority opponents were then referred to as the “elders,” or Sthāviras. According to these accounts, after years of discord within the monastic community, Aśoka convened a Council under the direction of the Buddhist monk Moggaliputta Tissa (ca. 327 BC – 247 BC) in order to rectify monastic conduct and to root out heretical views. After questioning by Aśoka, 60 000 monks were expelled from the community, and a select group of some 1 000 monks were charged to set down the contents of the Buddha’s true teaching. Moggaliputta Tissa is said to have recorded both the heretical views and their refutation in the Pāli scholastic text, the Kathāvatthu (Points of Discussion). Pāli sources also relate that at the conclusion of the Council, Aśoka promulgated an edict inveighing against future divisions within the community and sent missionaries to spread the Buddha’s teaching throughout his kingdom and beyond. This particular account of a Council at Pāṭaliputra, found only within Pāli sources, may reflect a conflict limited to the predecessors of the later Theravāda school. Despite differences in the scholarly interpretation of certain directives presented within the edict, it clearly condemns formal division within the monastic community (saṅgha-bheda) and declares that the community of monks and nuns should be united. Thus, this edict implies the presence of or at least the threat of divisions within a community that ideally should be united and stable. The Theravāda and Mahāsaṁghika sources cite differences in the monastic disciplinary code, and the Sarvāstivāda sources, differences in doctrinal interpretation. Here the Mahāsaṁghikas object to an attempt to tighten discipline through an expansion of the monastic disciplinary code and prefer instead to preserve the more restricted disciplinary rules as they stood. Scholarly consensus also prefers the view that the earliest distinct Buddhist groups emerged not through disagreements over doctrine, but rather through differences in their lineages of ordination (upasampadā) and in monastic disciplinary codes (Vinaya). While variety in doctrinal interpretation certainly existed even in the early period, the definition of formal division within the monastic community, which was eventually to be accepted by all groups, specifies monastic discipline as the key factor in the formation of independent groups. cannot automatically be assumed to denote independent monastic communities, additionally defined by different ordination lineages and monastic disciplinary codes. These doctrinally distinguished school names may instead have functioned simply as heuristic labels, meaningful within the context of doctrinal interpretation, scholastic debate, and teaching lineages, but having limited significance in the life of the monastic community as a whole. Such an interpretation would be consistent with the reports of Chinese pilgrims that monks of different doctrinal persuasion resided together within the same monastery, where they were presumably unified by the same ordination lineage and monastic disciplinary code. Therefore, at the very least, these 6 school names denote independent groups with distinct lineages of authority and separate monastic communities. All practitioners were to be accepted as disciples of the Buddha, and to be treated with courtesy, regardless of differing disciplinary or doctrinal allegiances. Traditional sources maintain that 18 schools emerged following the first schism, but since more than 30 school names are recorded, the number 18 may have been chosen for its symbolic significance. h) Sautrāntika, “those who rely upon the sūtras”). The later doxographic accounts, each of which is coloured by its own sectarian bias, do not agree on the chronology or on the order in which the schools emerged, but instead give temporal primacy to the particular group or school with which they were affiliated. They do, however, tend to agree on the basic filiation of the schools with either the Sthāvira or the Mahāsaṁghika branch and generally concur that the additional schools were formed within a century or two of the first schism. One group, the Kaukkuṭika, may have derived its name from the Kukkuṭārāma Monastery in Pāṭaliputra. Later sources interpret this name as reflecting the view that all phenomena can be described by one utterance, namely, the fact that all entities exist merely as mental constructs or provisional designations. and the Prajñaptivāda, or “those who offer provisional designations,” which might also imply the claim that the Buddha utilized not simply transcendent utterance or absolutely true language, but also provisional designations or relative language. Thus, the original Mahāsaṁghika branch appears to have been divided, at least in part, on the basis of a difference of opinion concerning the fundamental character of the Buddha’s teaching, either as exclusively transcendent or as both transcendent and provisional. They were also associated with a teacher, Mahādeva, who adopted and possibly reworked the 5 points concerning the characteristics of a “worthy one” that were cited by northern Indian Buddhist sources as the reason for the first schism between the Mahāsaṁghikas and the Sthāviras. Later accounts record as many as 20 or more schools that trace their origin to the Sthāvira branch. Any unifying entity such as personhood exists only as a mental construct or a provisional designation, which has no reality in itself. They saw a unifying entity of some type as a necessary basis for the notion of mutually distinct animate beings and for the continuity of their experience. Otherwise, the phenomena of moral action, rebirth, and religious attainment accepted by all Buddhists would be impossible. Consistent with this position, the Pudgalavādins also maintained the existence of an intermediate state (antarābhava) after death, a transition state that links the aggregates of one lifetime with those of the next. but also used a distinctive method of argumentation that challenged the growing rigidity of stringent Buddhist scholastic analysis. Pudgalavāda arguments employ a sophisticated method of negative dialectics that continues certain tendencies in the earlier sūtra dialogues and stands in sharp contrast to their opponents’ more straightforward, positivist methods. b) the Vijñānakāya (Collection on Perceptual Consciousness) of the Sarvāstivādins. but the presence in the Kathāvatthu of doctrinal positions associated with each of these 3 groups does not prove that adherents of these views formed separate schools at that time. The earliest inscriptional references to the name Sarvāstivāda, found in the north-western regions of Kashmir and Gandhāra as well as in the north central region of Mathura, date from the 1st century C.E. Both regions are connected by tradition with prominent early Sarvāstivāda teachers and later became strongholds of the Sarvāstivāda School. including the complete monastic disciplinary code (Vinaya), a portion of the dialogues (sūtra), and the complete collection of scholastic treatises (Abhidharma), as well as many other post-canonical scholastic texts and commentaries. The presence of certain texts in multiple recensions confirms that the Sarvāstivāda School was not homogeneous, but was rather a vast group distinguished by regional, chronological, doctrinal, and other differences. This was most likely true of all early Buddhist schools. In the case of the Sarvāstivāda School, these internal distinctions are clearly demarcated in their scholastic texts by the attribution of distinct doctrinal positions to Sarvāstivāda groups of different regions. also may have led directly to the emergence of a Mūla Sarvāstivāda school, whose separate monastic disciplinary code survives in Sanskrit, and to whom can probably be attributed other assorted sūtra dialogues and miscellaneous texts preserved in Chinese translation. Some suggest that the Mūla Sarvāstivādins represent merely a later phase in the development of the Sarvāstivāda sectarian stream. the Sarvāstivādins of Mathura became more significant and adopted the name Mūla Sarvāstivāda (root Sarvāstivāda) to proclaim their status as the original Sarvāstivādins. The Sarvāstivādins of north-west India were renowned for their scholarly study of Buddhist doctrine or Abhidharma. From compiling voluminous treatises called Vibhāṣā, commentaries on the most significant of their canonical Abhidharma scriptures, those in the Kashmiri Sarvāstivāda branch eventually came to be called Sarvāstivāda-Vaibhāṣika. The last and best known of these Vibhāṣā treatises is called the Mahā-vibhāṣā (Great Exegesis). these past and future actions or entities must, the Sarvāstivādins claim, be admitted to exist. the Sarvāstivādins responded with an elaborate ontology that attempted both to delimit the specific manner in which past and future factors exist and to preserve their conditioned and hence impermanent character. The original meanings and referents of these names as well as their relationship to one another remain the subject of scholarly disagreement. Proponents of this group may have used the term Sautrāntika (those who rely upon the sūtras) self-referentially, and their opponents among the Sarvāstivādins may have labelled them pejoratively as Dārṣṭāntika (those who employ examples). They rejected unequivocally the existence of past and future factors, and equated the existence of present factors with an instantaneous exertion of activity. In contrast to the complex array of existent factors proposed by the Sarvāstivādins, the Sautrāntika/Dārṣṭāntikas claimed that experience is best described as an indistinguishable process. The name Sautrāntika, “those who rely upon the sūtras,” also indicates a rejection of the authority that the Sarvāstivādins bestowed upon their separate canonical Abhidharma collection. In the early sūtras, Vibhajyavāda occurs as a descriptive term for the Buddha, who, in reference to various specific issues, is said to “discriminate” carefully rather than to take an exclusivist position. In their accounts of the Council at Pāṭaliputra, later Pāli sources use the term Vibhajyavāda to describe the correct teaching of the Buddha, and within Pāli materials the name continues to be used as one among several names for the Theravāda sect. A 3rd century C.E. inscription links the term Vibhajyavāda with the Sthāviras located in the regions of Kashmir, Gandhāra, Bactria, Vanavāsa (i.e., Karnataka), and the island of Śrī Lanka. This connection between the Vibhajyavādins and the north-western regions of Kashmir, Gandhāra, and Bactria clearly indicates that Vibhajyavāda was not simply another name for the Theravāda school. The Mahīśāsakas, Dharmaguptakas, and the Kāśyapīyas, attested in inscriptions from the North-west, are all connected by later sources with the Vibhajyavādins. As a result, the name Vibhajyavāda might be best characterized as a loose umbrella term for those, excluding the Sarvāstivādins, who belonged to the original Sthāvira branch. A review of the many specific doctrinal views explicitly attributed to the Vibhajyavādins in the scholastic literature of the Sarvāstivādins supports this interpretation. - and finally, that the time periods (adhvan) are permanent in contrast to conditioned factors, which are impermanent. and the Dharmaguptakas advocated offerings to the Stūpa as representing the unsurpassed path of the Buddha, who is distinct from and far superior to the community. The connection of the Theravāda school to the original Sthāvira branch is clearly indicated by its Pāli name thera, which is equivalent to the Sanskrit, Sthāvira, and by close ties to the Mahīśāsaka School suggested by both textual and doctrinal similarities. Traditional sources claim that Buddhism was brought to Śrī Lanka by the missionary Mahinda, either after the death of Buddha’s direct disciple, Ānanda, or during the reign of Aśoka in the mid-3rd century B.C.E. c) and finally the Jetavanīyas, dating from the fourth century C.E. The Theravāda textual collection, including both canonical and extensive extracanonical and commentarial texts, is the only early Buddhist collection extant in an Indian language (Pāli). Theravāda doctrinal positions often accord with those attributed to the Vibhajyavādins, in opposition to those of the Sarvāstivādins. - and that worthy ones (Arhat) cannot retrogress from their level of religious attainment. Perhaps the most distinctive view adopted by the Theravādins is that of a fundamental and inactive state of mind (bhavaṅga), to which the mind returns after each discrete moment of thought, and by which one rebirth state is connected with the next. Further, regarding the Sarvāstivāda claim that factors exist in the past and future, the Theravādins adopt the position that only present factors exist. - that Nirvāṇa is the only unconditioned factor. Thus once again, a doctrinal picture of the various early Indian Buddhist schools reveals a complex mosaic of both shared and distinctive doctrinal positions. - or among lay religious practitioners. 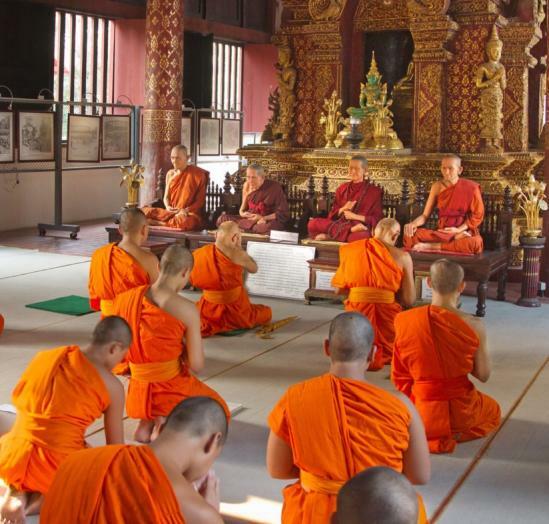 Although it is doubtful that any particular mainstream Buddhist school can lay claim to the Mahāyāna, it is clear that later Mahāyāna practitioners adopted the monastic disciplinary codes of mainstream Buddhist schools. - and a fundamental, subtle form of thought. - that were established in mainstream Buddhist schools, determined the course of Buddhist inquiry and practice in India for some one thousand years.